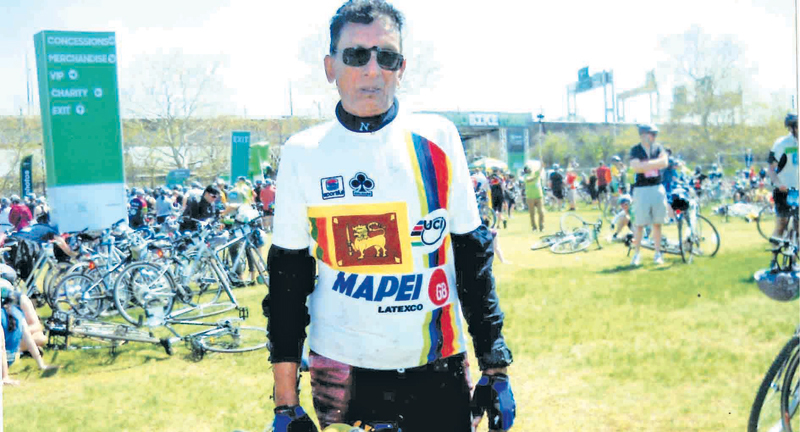 “Ride with Pride” cycling rally was held for the second successive year in Colombo recently. The event was organized by the Sri Lanka Army under the patronage of cycling enthusiast and the Army Commander Mahesh Senanayake in collaboration with the Army Cycling Club. Brigadier Duminda Sirinanda, Lt. Colonel Randi Jayasinghe, Major Muthumala are few other officers of the Sri Lanka Electrical and Mechanical Engineers Regiment (SLEME) who have supported the event. Cycle races on roads are common, but this ‘Cycling for all’ event was completely different to racing. The cycle parade started from Gall Face and continued to Panadura then proceeded on the same route back on the Gall road to finish at Katubedda SLEME camp. Over hundred cyclists, men, women, youngsters and veterans took part in this historic event. Along with the veteran cyclists, cycling great Anthony Symons too participated in the parade which proceeded at one speed. There was a bog crowd cheering on the road acknowledging cycling as a part of lifestyle. This type of events are very popular in over seas like USA, Australia. Speaking about the event veteran cyclist Anthony Symons said that he has participated in similar events over seas in 1996, 2001 and 2015 at the New York Five Borro Tour where over 35,000 cyclists from across the globe taking part annually. These events are organize to popular cycling while prevent drugs, alcohol and smoking addictions. These rallies are also popular as leisure and physical fitness activity all over the world. AT the completion of ‘Ride with Pride’ event at Katubedda all cyclists were treated with Kolakenda, milk rice, kadala, Green gram and traditional foods. The event has become a great success thanks to the Sri Lanka Army, the organizers of the event. These type of events will help to attract masses and will greatly be helpful to spread the news of a healthy lifestyle with cycling.